The simple reasons to leave it to the pros. Getting ready to put your car up for sale? A car that’s been properly detailed throughout its life will help get maximum dollar upon selling. When selling you want to put your best foot forward and make the vehicle look as attractive as possible, professional auto detailing will do just that (well beyond what many of us are capable of in our driveway). Make your car stand out from the rest by having it truly detailed from top to bottom. Even if you’re not ready to sell your car right away, chances are you won’t be keeping this car forever so the proper care and detailed protection you do now could add to your resale profit later. We actually wrote all about this right here. Your paint and trim are exposed to extreme heat, bitter frosts, road salt and other harmful chemicals. With experienced care your car can be saved from unnecessary corrosion and rusting (especially near coastal waters like us). Professional detailers know the safest and most effective products to use to prevent and protect your vehicle from such damage. Such proactive protection early on will help keep your car looking new and save you from investing in cosmetic repairs. We wrote about our solution to this problem right here. How come professional auto detailers can get your car so much cleaner than you can at home? They have special tools and products on hand to get the best results many of which are not offered in your local car parts store. For you to try to replicate their tools and products in order to detail your own car a few times a year would be cost prohibitive. The tools and products alone cost hundreds of dollars (or more), much more than the cost of detailing your car one time. We looked at issues associated with power tools right here. Did you know that by using the wrong product or doing your own buffing incorrectly you could end up damaging the paint on your car causing hundreds or even thousands of dollars’ worth of damage to repair? Eliminate the risk of doing unintentional damage to your car by hiring a certified professional with years of experience and a proven track record for results. Depending on the extent of the detailing, this project can take anywhere from a couple of hours to all day long. If you have no experience then you can pretty much double that time frame. By hiring a professional to detail your car you can save a ton of time and be more productive. Why waste an entire day when a professional can have it done for you in proper time frame leaving your day free to do other things? When it comes to the care of your automobile, trust an expert to get the job done for you. 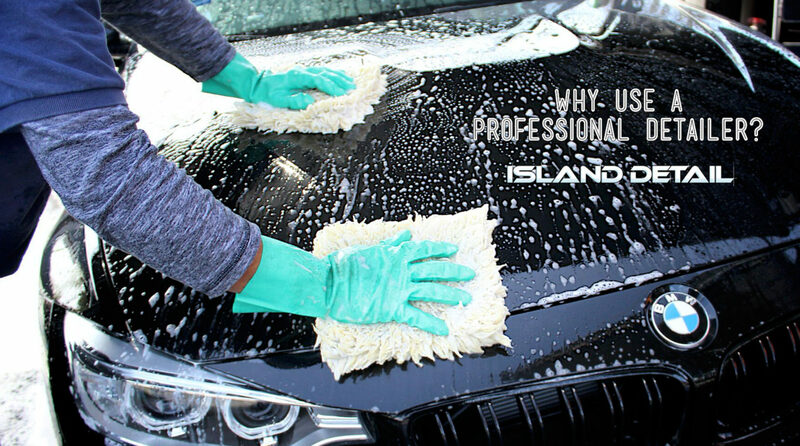 With the right tools, products and experience a professional detailing service can get your car a lot cleaner than washing and cleaning at home. With a highly skilled detailer you can expect great results in a fraction of the time and not risk damage to your car. Interested in hiring a pro in the Victoria area? Give us a shout, we would love to hear from you.